Today, we look at Amazon’s move into medical devices. Last month, we asked: Would You Buy Your Prescriptions at Amazon? It seems that the online behemoth knows no limits. And it realizes the enormous potential of health-related products. 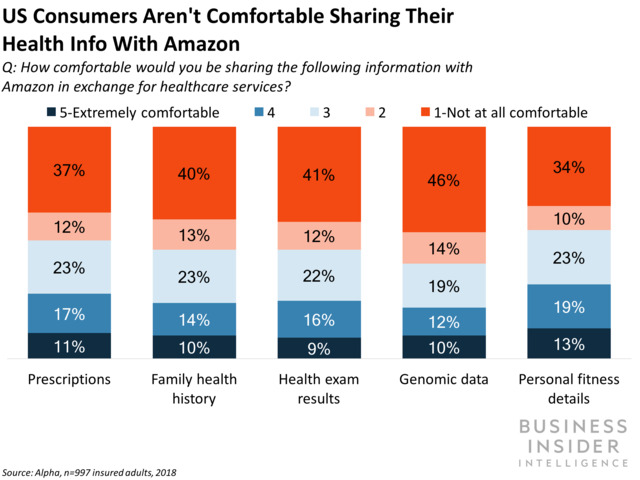 Look at how far Amazon has to go in getting shoppers’personal information. Would You Buy Your Prescriptions at Amazon? Until now drugstore chains, independent pharmacies, mail-order delivery from prescription suppliers, and in-store pharmacies in retail stores have been the major ways that we buy prescription drugs. Now, Amazon intends to change this — as it has so many other business segments. So, would you buy your prescriptions at Amazon? Author Living Well with CancerPosted on October 2, 2018 September 29, 2018 Categories Health Care Spending, MedicineTags Amazon, Business Insider Intelligence, prescription drugs, shopping1 Comment on Would You Buy Your Prescriptions at Amazon?